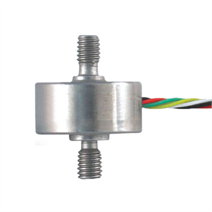 Miniature tension/compression force transducers are designed for static and dynamic measurement tasks in the direct fl ux of force. They determine the tension and compression forces in a wide scope of applications. It is possible, for example, to measure the actual force in ropes and rods. The force is applied to this tension/compression force transducers via threaded bolts, which are located on each side of the cylindrical body. The force transducers is available from a rated force of 1.5 N.
To prevent overload, it is advantageous to connect up the force transducer electrically during installation and to monitor the measured value. In mounting the force transducer torsion and bending moments have to be avoided.